Using our Stacking tool found within our Player Models, this piece identifies some of the top stacks of the weekend. Check out our Correlations page as well to find hidden edges in stacking positions and games. The Seahawks go on the road this week to play the 49ers, who are one of the more favorable matchups for opposing quarterbacks. San Francisco is 12th in situation-neutral pace, 25th in pass DVOA, and 10th in DraftKings points allowed to opposing quarterbacks. Even though the Seahawks are the most run-heavy team in the league (51% overall), Wilson has managed to throw 29 touchdown passes this season. This is a particularly good matchup for Wilson because the Niners struggle greatly on deep passes. They are allowing the ninth-most yards per deep pass attempt, and rank 31st in deep-ball DVOA. Wilson owns the fourth-highest aDOT in the NFL at 9.82. The Seattle receiver seeing the most usage since their Week 7 bye is Moore, whose 0.61 Weighted Opportunity Rating would be top 15 in the league over the course of the full season. Moore’s aDOT is 18.5 on the year. Despite his usage numbers, Moore continues to be the third-highest-priced Seattle receiver on DraftKings and second-highest on FanDuel. The quarterback/defense stack is not one I often deploy, but it makes sense this week when you consider that Jackson is not only the Ravens’ quarterback, but he also functions as a running back. In Jackson’s four starts, he is second on the team in rush attempts (67) and rush yards (336), with two rushing touchdowns and a 5.01 yards per carry. The Ravens have a rushing success rate of 65% in Jackson’s starts, compared to just 49% in games started by Joe Flacco according to Sharp Football Stats. The Rams (59%) are the closest team to the Ravens in season-long success rate. Jackson is the catalyst for the best rushing team in the league. Tampa Bay has given up rushing yards in bunches, allowing 5.36 yards per carry since Week 7. Meanwhile, Jameis Winston has been sacked eight times in the past two weeks, and Baltimore ranks fifth in adjusted sack rate. Winston is also sporting a 4.4% interception rate on the year. The Ravens are 7.5-point home favorites. Cousins has been up and down all year, but his highs are exactly what we should be chasing in tournaments. Though he has eight games under 20 DraftKings points this year, he has also had three games of more than 30. Miami is not an up-tempo team by any stretch (27th in situation-neutral pace), but the Dolphins are 26th in pass DVOA and allow the fifth-most DraftKings points to opposing quarterbacks. Anytime you stack Cousins, it is easy to decide who to pair him with. There are only 14 players in the NFL who have a Weighted Opportunity Rating of 0.60 or higher. The Vikings have two of them. Thielen and Diggs each account for at least 25% of Minnesota’s targets, and should see very little resistance against a Miami secondary that likely will be playing without Xavien Howard once again. On the other side, Stills has flourished anytime Ryan Tannehill has been at quarterback for the Dolphins. His Weighted Opportunity Rating is 0.61 under Tannehill, an elite number, but just 0.20 in games started by Brock Osweiler. Tannehill is banged up, but expected to start this weekend, making Stills a great value at his cost. Credit: Brad Rempel-USA TODAY Sports. Pictured: Adam Thielen and Stefon Diggs. Brady had his best fantasy game in Week 14 since all the way back in Week 5 against the Colts. Now he faces the Steelers in what is by far the highest projected scoring game of the main slate. The Vegas total in this game is set at 52, and no other game total is above 47. Both of these teams are top 10 in situation-neutral pace. New England finally has a healthy receiving corps, with Edelman and Gronkowski coming in as the top two receiving targets after the Patriots’ bye. The Steelers are one of the worst teams in football at defending tight ends. They allow the sixth-most DraftKings points to the position, and the fifth-highest plus/minus. They are also 31st in DVOA against tight ends. While Josh Gordon will likely be shadowed by Joe Haden, Edelman has an appetizing matchup with Mike Hilton in the slot. He has allowed by far the most yards and fantasy points per route covered of Pittsburgh’s starting corners. While Antonio Brown may be falling off a cliff, he has still had extreme positive home splits this season. In a projected shootout, Brown should be able to produce, and he has come down $500 and $200 in price on DraftKings and FanDuel respectively. 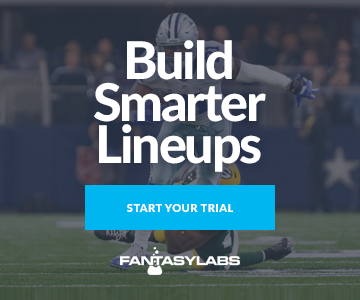 Be sure to check out our industry-leading NFL News and Models, along with our Multi-Lineup Builder, Stack builder, ownership projections and more. Also, make sure to check out our other tools for the 2018 season, including the Matchups page, DFS Contests Dashboard, NFL Ownership page, and NFL Correlations page.